I posted this announcement on Stampin Inspirations but in the case you don't read my other blog.. . . I'll post this announcement here too! A few of you noticed that I have the "Stampin Up" catalog picture to the right of my blog rather than the Close to My Heart picture. Yes, I switched back to Stampin Up!! Yipee, Whoohoo!! Why, Maria? Well. . .there were a few factors. . .primarily, my frustration on my inability to "promote" CTMH on my blog. . .it violates CTMH policies. Not that I'm big on heavily promoting on my blogs but I wanted to be a little bit more open about the fact that I was a consultant. I won't go into it but yeah. . .it was a bit frustrating. I was doing really well with CTMH but I sort of was "stagnant" without my ability to tell you all about my club site, website, or anything going on with CTMH. Furthermore, I've come to the realization that I'm more of a Stampin Up gal! I missed Stampin Up! CTMH really pushes scrapbooking stuff and I hate to say it but I'm not a big scrapbooker. I wanted to be but it's secondary to card making on the totem pole. LOL! Besides, Stampin Up has so many NEW and EXCITING stuff going on. I cannot begin to even tell you about it! I decided to create a club site which is open to the public. This is where I'll post everything and anything and only about Stampin Up. This site will only contain cards and projects using 80 to 100% of Stampin Up products. I wanted to make the site "public" when I have more stuff posted but I decided to just let y'all know about it. I couldn't hold myself back. . .I'm just way too excited about it! LOL! 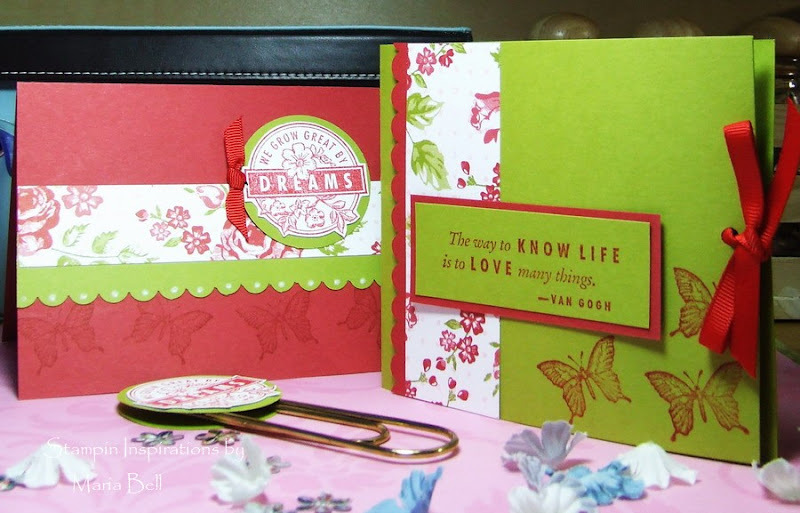 Stampin Inspirations will remain the same. . .I will not be doing any promoting here and will continue to post all brands of stamping products on this site. I know some blog readers hate being pushed to "buy" stuff and such. So, not to worry. . there will be no pushy sales person on this blog site. Furthermore, only retired Stampin Up stuff will be posted here. All the new stuff Stampin Up stuff will be posted on the club site. The club site is where my club members can view tutorials (certain ones accessible to club members only), cards, and projects and also be updated on promotions, sales, and announcements that Stampin Up has to offer but you all can check out what is going on too without having to be a club member. Sooo. . . .without further ado. . .visit my club site: Stampin Inspirations Club Site or click on the link at the top. I hear ya' chuckling. . .I know, it's not a very original title for a blog site!! LOL! There's not too many post and some sections are still under construction but visit the site anyway!! I'm enrolling new club members but I'm limiting the amount of members. . . .so I guess, it's first come, first serve kind of thing. It's an on going monthly enrollment so if you can't join right away, you have the beginning of each month to join. Anyway. . .hope to see you stopping by my club site once in a while!! Congratulations Maria!!! Much success to you girl! I think your happier doing SU, I'm with you, scrapping is second now since I got into stamping & making cards.